April 14, 2019—As spring arrives, many homeowners set out to clean gutters, wash windows, prune trees and tackle a host of other chores. And many of these projects will require a ladder. But before you step up, brush up on safety. If you're not careful, ladder accidents can leave you with cuts, bruises, broken bones or worse. Avoid that by following these tips from the National Safety Council and the American Academy of Orthopaedic Surgeons. Wear the right shoes. Sneakers or boots with laces are best. Avoid flip-flops, sandals or leather-soled shoes—they can be slippery. Choose the right tool. Don't stand on a chair or on your tiptoes. With tall stepladders, stay at least two steps down from the top. 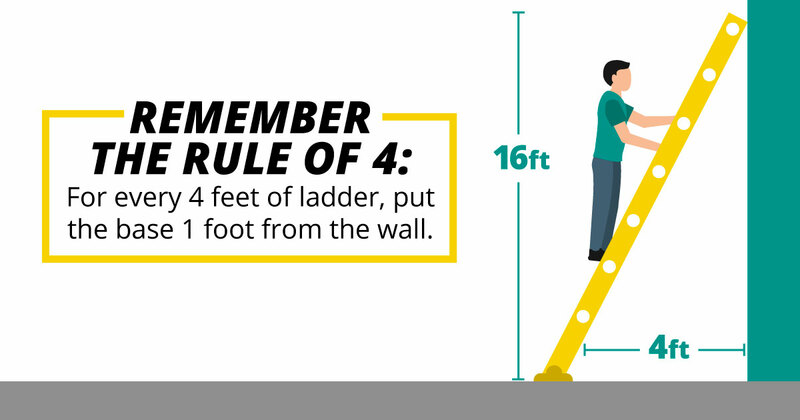 When using a single or an extension ladder, don't go higher than the third rung from the top. Find stable, even ground. Then do a safety check. Be sure the steps or rungs aren't slippery with grease or mud, and check that the screws are tight and that nothing is damaged or bent. Space it out. Place extension ladders 1 foot away from the wall for every 4 feet of ladder. For example, the base of a 16-foot ladder should be 4 feet away from the wall. If you're going to the roof, the ladder should extend at least 3 feet beyond it. Stay in the middle of the rails and hold on. Don't lean too far to either side—try to keep your belly button between the sides of the ladder. If you can't reach what you need, get off the ladder and move it. Try to keep three points of contact with the ladder, such as two feet and one hand. If you feel faint or you've taken a medication that makes you dizzy or tired, don't get on a ladder. Springtime is known for thunderstorms and tornadoes in some parts of the country. If there is the potential for high winds or lightning strikes, save the project for another day. If the weather changes once you're on the ladder, climb down and wait for it to clear. April showers may bring thunderstorms. Do you know how to stay safe when there's lightning in the air? This thunderstorm safety infographic can help.